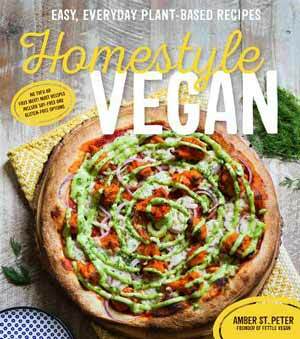 You are here: Home / Recipes / The 25 Best Vegan Cookbooks Ever! So… you’ve decided that it’s time to eat more veggies. Maybe you’re done with dairy and how it bloats you and upsets your skin. Maybe you’ve read about how factory farmed meat is terrible for the environment, animals and for world hunger. Approaching a plant-based diet can be daunting for anyone who has grown up amidst a culture of meat and dairy, where it's normal to melt half a pound of butter into the skillet as the base of every meal, or for those who automatically associate roast chicken with a Sunday comfort dinner at home. But you'll be please to know that cooking plant-based meals that use no animal products (vegan) is actually easier than you may think. 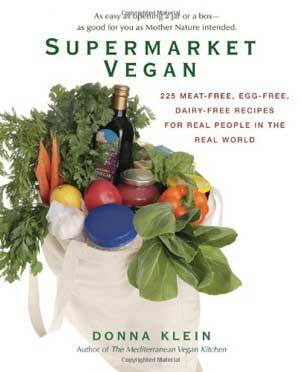 Check out my picks for the top 25 vegan cookbooks on the market! 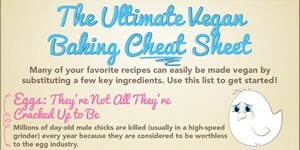 Best 25 Vegan Cookbooks, Ever! 1. 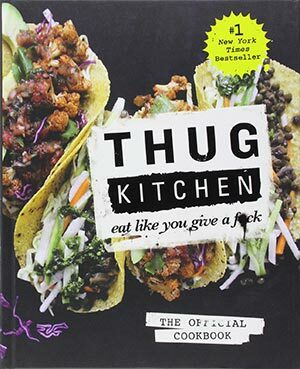 Thug Kitchen: The Official Cookbook: Eat Like You Give a F*ck is the ultimate non-believer’s guide to vegan food. Written hilariously and frankly, Thug Kitchen encourages readers to ‘elevate their kitchen game’ with delicious recipes like Roasted Beer and Lime Cauliflower Tacos, Pumpkin Chili and Grilled Peach Salsa. Chock full of information and techniques that are more hilarious than preachy, Thug Kitchen teaches cooks of all levels to cook and eat like you give a f*ck. 2. Homestyle Vegan: Easy, Everyday Plant-Based Recipes is the perfect cookbook for anyone who is hung up on old favorites like Apple Cider Donuts, Biscuits with Gravy and Chicken and Dumplings. Chef and Author, Amber St. Peter, recreates all of these and more with 80 recipes of pure deliciousness. 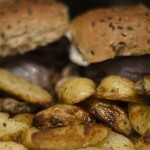 Recipes are free of tofu and faux meat- most can also be made soy free and gluten free! 3. Vegan. 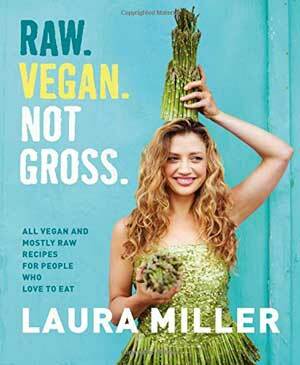 Not Gross by Laura Miller (of Tastemade YouTube fame) is a hilarious testimony to the magic that can come from a (raw!) vegan kitchen. This cookbook will have readers more comfortable handling produce and experimenting with mostly raw (and delicious) recipes. Miller whips up Sweet Potato Curry, Lavender Cheesecake and Ginger Maple Granola all while infusing the book with enthusiasm and a healthy dose of humor. 4. But I Could Never Go Vegan! is something we’ve all said at one point. 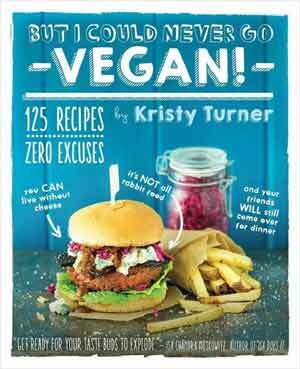 Kristy Turner packs her cookbook full of 125 recipes that ‘prove you can live without cheese’ and promises that ‘your friends will still come over for dinner.’ Turner bans excuses with budget friendly ways to make vegan speciality products and recreates traditional delicacies. Examples of dishes include: Tempeh Bacon Mac ‘n’ Cheese, Lemon Cornmeal Waffles with Blueberry Sauce, and Gnocchi alla Vodka. Kristy Turner, banishing doubts about veganism one brownie at a time. 5. Baconish is a sassy retort to the cultural craze for bacon, especially in the wake of the World Health Organization’s 2015 warning about processed meat (bacon) cancer-causing tendencies. 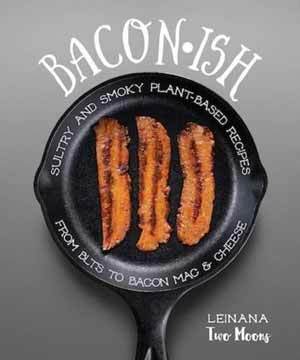 Author Leinana Two Moons incorporates the salty, smoky bacon essence into all of the recipes in this book, which includes dishes like Bacon Apple Fritters, Bacon-Stuffed French Toast and Pasta Carbonara. As Two Moons says, you can keep your bacon…and your health, too! 6. 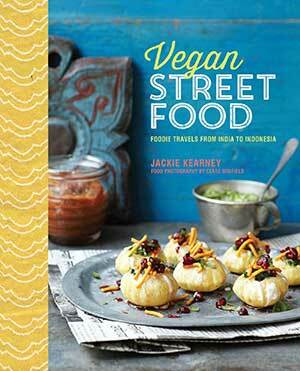 Vegan Street Food: Foodie travels from India to Indonesia is a fantastic gift for any world traveling vegan, or simply anyone with a global pallet. Smash the misconceptions that being vegan means eating plain quinoa, and spice up your dinner with 100 dishes from Sri Lanka, Thailand, Laos, Vietnam, Malaysia, Indonesia and India. A note: this cookbook is for the more experienced chef, and the one who will enjoy tracking down a myriad of eclectic ingredients- but for travelers, this can be half of the adventure! 7. 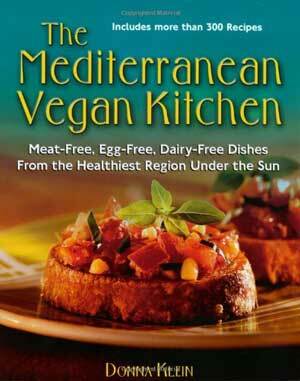 The Mediterranean Vegan Kitchen is for those Mediterranean food lovers who would rather see lambs out in the pasture. This book contains recipes that include eggplant relish, classic minestrone, Moroccan salad, zucchini-lemon couscous, Greek currant cake and more! Lauded as truly authentic recipes, the Mediterranean Vegan Kitchen is great for anyone looking to veganize their favorite dishes and even includes a ‘meals in minutes’ section for those in a pinch! 8. 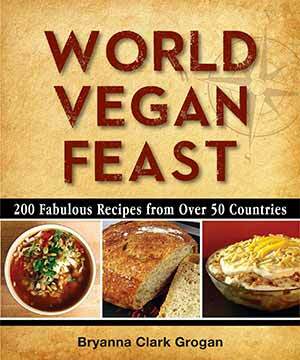 World Vegan Feast: 200 Fabulous Recipes from Over 50 Countries is the perfect book for those who will eat everything but animal products. Lovingly compiled after years of travel, World Vegan Feast is perfect for adventurous cooks who want to try a little bit of everything. Additionally, the book is clearly written and the simple techniques will appeal to even the most beginner chefs! 9. 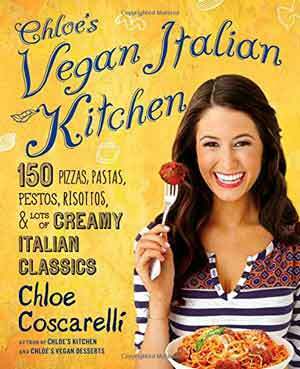 Chloe’s Vegan Italian Kitchen proves that adopting a plant-based diet doesn’t mean you have to reject your family’s food. Embrace Italian food through Chloe’s Vegan Italian Kitchen, which is filled with 150 takes on classic Italian dishes, like Butternut Ravioli, Crispy Sage and Red Wine Seitan, Potato Gnocchi, Eggplant Parmesan and Mint Chip Gelato Sandwiches. Chef Chloe also includes substitutions to make dishes allergy and gluten-free, if these are concerns at your Italian table! 10. 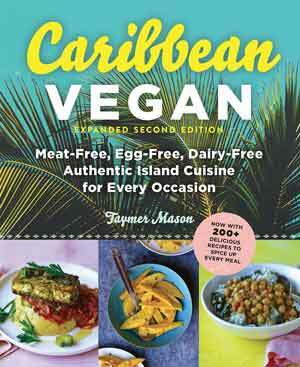 Caribbean Vegan: Meat, Dairy & Egg-Free Authentic Island Cuisine is a unique opportunity to experience the magic and flare of Caribbean cuisine, but cruelty free! This cookbook focuses on the rich complexity of Caribbean fare, which is influenced by African, French, Spanish, British, Asian and Indian cuisine, and teaches the reader about the importance of spice and herbs in the kitchen. Can’t get away in the near future? With this cookbook, you’ll be feeling the heat of the Caribbean in no time! 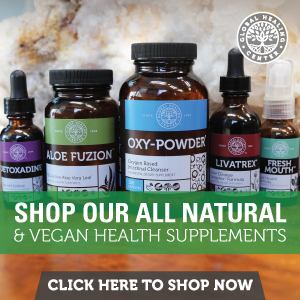 – For the busy vegan: recipes that specialize in healthy food in a pinch! 11. Isa Does It is a testimony to the fact that cooking nourishing, delicious vegan food doesn’t have to be a laborious affair. 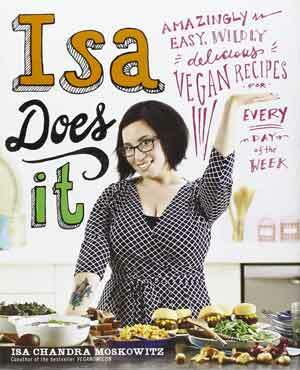 In fact, writer and chef, Isa Chandra Moskowitz, makes all of the meals in her book (from scratch!) everyday, in 30 minutes or less! Isa Does It is packed with 150 recipes that will help you get a healthy meal on the table every day of the week, including dishes like Bistro Beet Burgers and Summer Seitan Saute. Easy instructions and ready availability of ingredients in most supermarkets makes Isa Does It a great addition to any busy cook’s collection. 12. Supermarket Vegan gets that you’d like to spend a lot less of your time running around, looking for fancy ingredients. So…the authors of The Mediterranean Vegan Kitchen have compiled a collection of over 225 plant-based recipes that can be cooked easily with ingredients found in your local supermarket. The recipes cut out expensive meat, egg and dairy “substitutes” that can be costly. With easy tips and tricks, Supermarket Vegan will have you in and out of the market, and on the way to making a delicious dinner. 13. 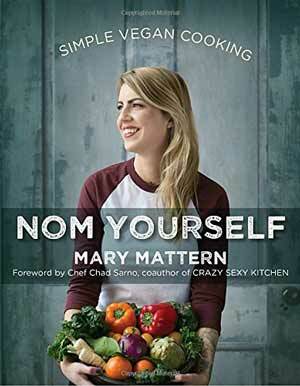 Nom Yourself is a cookbook that delivers both style and ease with a series of delicious American-inspired vegan recipes that include twists on favorites like Beer-Battered Buffalo Wings, American Apple Pie, and Creamy Cashew Alfredo. With easy instructions and simple-to-find ingredients, Mary Mattern’s beautiful cookbook is a great addition for any vegan who is looking for simple recipes that can spice up the kitchen. 14. Quick-Fix Vegan promises that the 150 recipes it contains can be prepared and served in 30 minutes or less. Filled with meals like Pantry Paella, Quick Cornbread, Fiery Korean Stir-Fry, and Fire and Ice Sesame Noodles, author Robin Robertson ensures that a speedy dinner doesn’t compromise on taste. 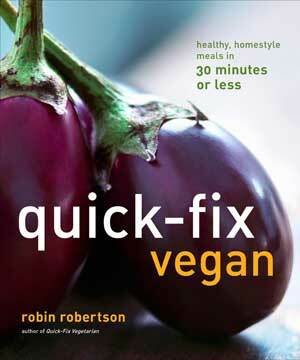 Robertson is also a thirty year vegan culinary expert and this cookbook has won awards! 15. 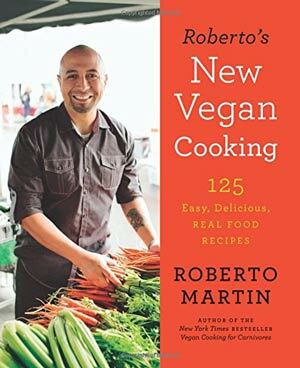 Roberto’s New Vegan Cooking is based on the premise that delicious, healthful, plant-based meals don’t have to take all day. The chef and author, Roberto Martin, bases his recipes off of his Mexican-American heritage, so the cookbook features family favorites such as Albondigas Soup and Jackfruit Tacos. The collection is full of culinary delights and tips and tricks that will save you loads of time! 16. 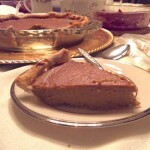 My Sweet Vegan is a sure-fire recipe guide for those nervous about serving vegan desserts to a tough crowd. 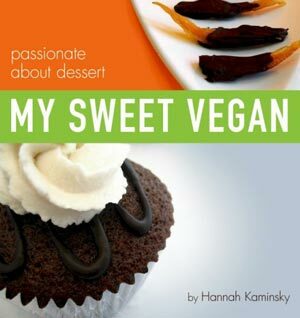 Author Hannah Kaminsky promises that each recipe has been taste tested (and approved) by vegans and non-vegans alike, and ensures that My Sweet Vegan has a recipe for any gathering or celebration. Desserts include Chocolate Chip Cookie Pie, Triple Threat Chocolate Cheesecake and Mocha Devastation Cake. Simple, step by step instructions are included for nervous bakers! 17. 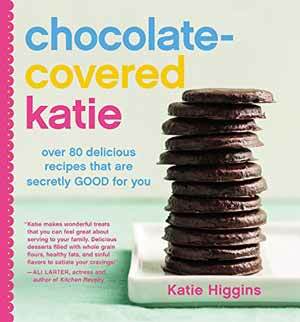 Chocolate-Covered Katie is the cookbook version of Katie Higgins’s wildly popular blog (of the same name) for those with a sweet tooth, but also a love of skinny jeans. Higgins has crafted a cookbook of over 80 recipes that include decadent treats like Peanut Butter Pudding Pops and Chocolate Obsession Cake. As promised, Higgins uses only real ingredients in her recipes, omitting anything unnecessary or unhealthy, without compromising on decadence. 18. 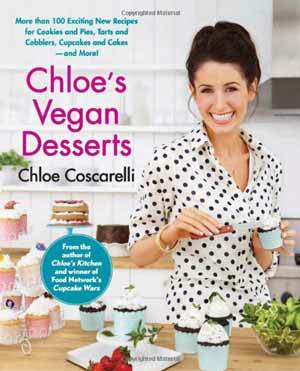 Chloe’s Vegan Desserts is a delightful dessert cookbook from the first vegan winner of Cupcake Wars. Chef Chloe Coscarelli can win over any palate with over 100 dessert recipes that includes New York Style Crumb Cake, Tiramisu Pancakes and Chocolate Beer Cupcakes with Irish Whiskey Buttercream. Coscarelli’s book also includes veganized version of holiday favorites, so you’re guaranteed a sweet treat at any celebration this year! 19. 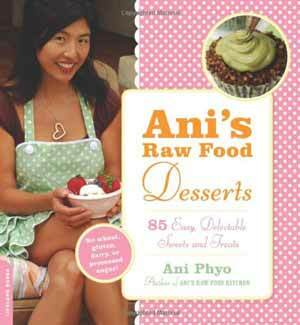 Ani’s Raw Food Desserts is for all of the non-bakers out there! Ani Phyo’s delicious dessert recipes are wheat-free, gluten-free, dairy-free, processed sugar-free, and of course- cruelty-free. 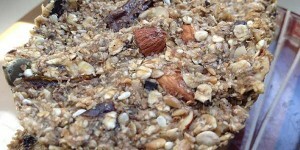 Ani promises that you’ll get all of the flavor of your favorite desserts, but with the nutrients of added superfoods. Recipes include Raspberry Ganache Fudge Cake, Chocolate Crunch Cupcakes, Spiced Blueberry Cobbler and Nectarine-Raspberry Crumble. 20. 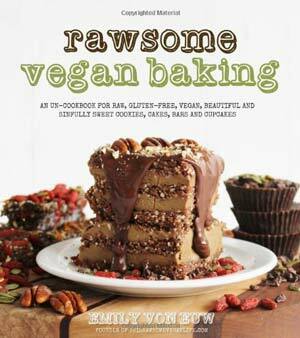 Rawsome Vegan Baking is what author Emily von Euw calls an “un-cookbook.” The author, who is the creator of the blog, This Rawsome Vegan Life, shares her raw, vegan and gluten-free dessert masterpieces in this cookbook. Recipes include Peppermint Chocolate Molten Lava Cakes, S’mores Cupcakes and Go-Nuts Donuts with Frosting and Fruit Sprinkles. These recipes are so delicious, your friends might not even realize they’re vegan and raw! – And finally, the holy grail of vegan cookbooks! 21. 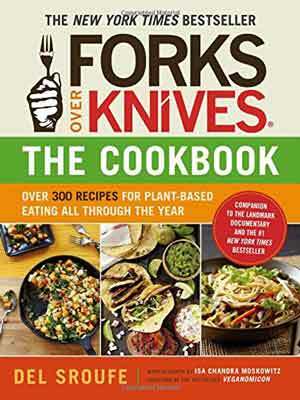 Forks Over Knives is the cookbook companion to the popular documentary outlining the health benefits of going vegan. This cookbook is an essential for anyone looking to lose weight, lower cholesterol, avoid cancer and prevent/reverse diabetes and heart disease. This book is filled with delicious recipes that eschew meat, dairy and oil, but promise to deliver big on flavor! If you’re considering a plant-based diet for health, this is the holy grail of vegan health cookbooks! 22. 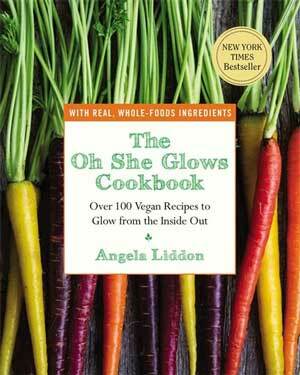 The Oh She Glows Cookbook is the gorgeous product of self trained chef, Angela Liddon. After recovering from an eating disorder, Liddon decided to make dietary changes to incorporate whole, plant-based foods. The result was a noticeable inner and outer glow. Liddon shares more than 100 delicious and healthful recipes that include bowls, stir-fries, soups and salads. The book is also a New York Times bestseller. 23. Keep It Vegan is Áine Carlin’s simple, wholesome approach to vegan cuisine. 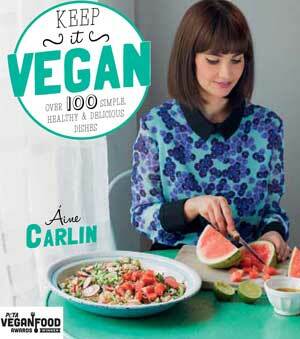 Packed with 100 no fuss, easy-to-follow recipes, Carlin’s cookbook is sure to appeal to vegans and non vegans alike. Chapters include meal-specific recipes like Rosemary and Pear Stuffed French Toast and Sweet Potato Sushi. Ingredients can be found easily at a local supermarket, and everyone will enjoy coming to the table if you’re cooking with this book! 24. 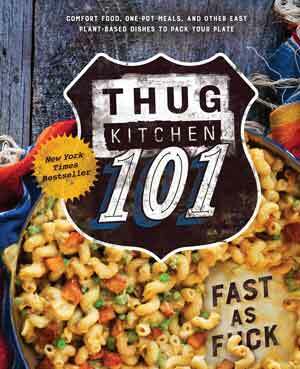 Thug Kitchen 101 is another addition to the Thug Kitchen cooking series, but it’s a book that no vegan chef should be without. 25. Veganomicon: The Ultimate Vegan Cookbook is, as it says, the ultimate in crowd-pleasing vegan fare! The book includes over 250 recipes, plus sample menu ideas. 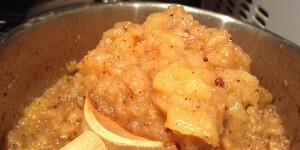 Dishes include Autumn Latkes, Chile-Cornmeal Crusted Tofu Po’Boys and Pumpkin Crumb Cake with Pecan Streusel. All meals can be made soy-free, gluten-free or low-fat, and most recipes are created with a time limit in mind. You can rest easy with this cookbook, knowing you have the tools to create a beautiful, nutritious and delicious menu for any occasion- without slaving away in the kitchen all day! 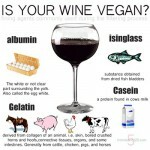 Vegans and Alcohol: Wait, They Put What in My Beer? !